This is informal response to David Farrell's article How to upload a script to CPAN. Preamble: CPAN is great. This post in no way should be treated as Sparrow VS CPAN attempt. Sparrow is just an alternative method to distribute your scripts. Ok, let's go. Notice I have called my script story.pl? This is a naming convention for sparrow scripts. Here we just require that script yields into stdout one of two lines - bar or rab. That is it. 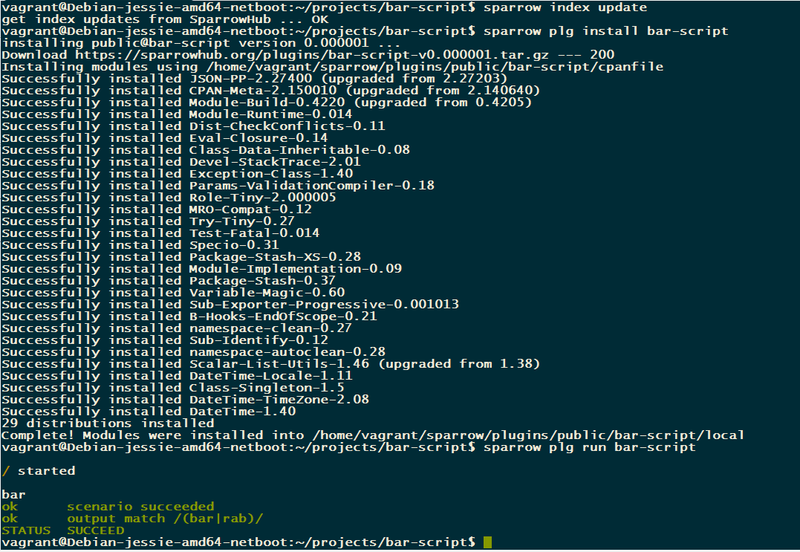 Sparrow uses carton to run script with dependencies. That is it. Strun - is utility comes with Sparrow to run sparrow scripts, it is used by plugin developers. Now you can browse the script information at SparrowHub. PS. Thanks to David Farrell for "giving" an idea of writing this post ( after reading his article ) and for fixing some typos and style errors in this document.